Ann Coulter’s definition of “normal” is someone just like her. 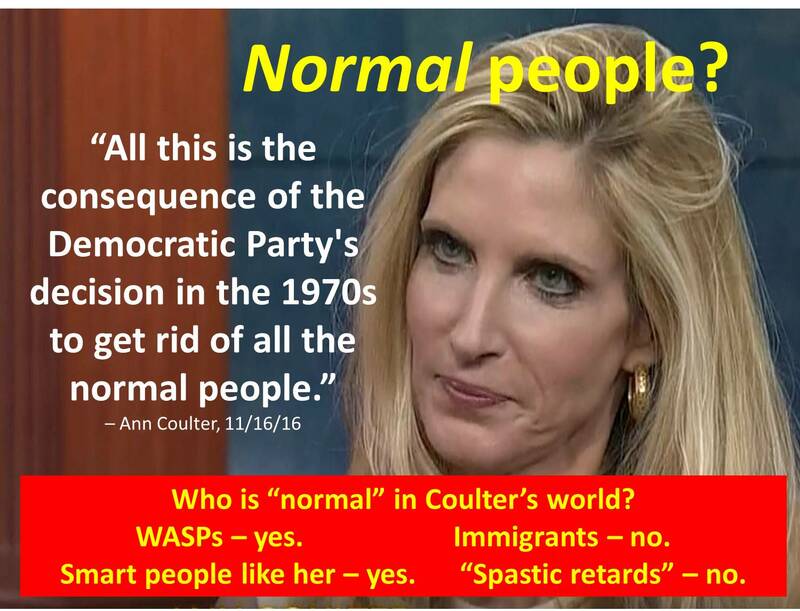 Hearing Coulter – lover of words like “retarded” and defender of going “full-on spastic retard” – (for the sheer joy of being offensive) – use the word “normal” with regard to people almost be deemed Hitlerian. Taken in the context of the Alt-Right’s rise to power this election cycle – an Alt-Right which would relish jettisoning the majority of mankind into the dustbin of history – Coulter speaking of “normal people” takes on far greater significance. Remember, Coulter truly hates soccer – because it is “foreign” – and hates all foreigners and immigrants. especially Mexicans. Coulter even hates Christian missionaries for going to foreign countries. She hates Gov. Nikki Haley for being an ignorant second-generation immigrant (meaning, she is a native-born American with foreign parents). 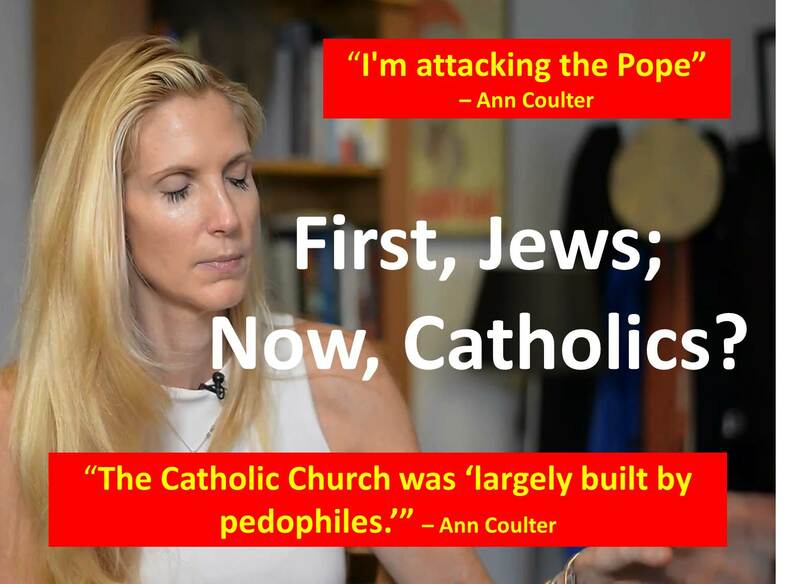 Coulter’s views can arguably be called anti-Semitic and anti-Catholic. She even attacks war heroes and Gold Star families. Coulter’s hatred also extends to other Americans. She loves to call Democrats Nazis, crazy, and demonic. Coulter hates Carly Fiorina and the GOP. Ben Carson does not fare well with Coulter. She has had a love-hate relationship with Ted Cruz. Once a Reagan-lover, Coulter now derides Reagan and his legacy. For Coulter, “normal people” are just like her. But there aren’t too many of them because she is genetically superior to us. The Alt-Right’s view of the world is distinctly nativist, racist, and supremacist. Ann Coulter is its high priestess and its muse. Welcome to Ann Coulter’s world. The Donald’s “Great Wall of Trump” was a lie from the beginning, a clever marketing ploy to tap in to the legions of Americans who are deeply concerned about America’s national sovereignty and her obeisance to the open borders lobby. Nevertheless, this huckster succeeding in grasping the GOP nomination based on lies. Trump will not erect an impenetrable wall to stop illegal immigration. Trump will not oppose amnesty. We knew those two truths before the GOP Convention. The Great Wall of Trump is, like the Statue of Liberty, symbolic. It symbolizes the substance of the debate over national identity, national sovereignty, border control, and amnesty. And, like Trump himself, it is a sham. So, Trump pledges to “secure the border” and get the “bad hombres” out (the “drug lords”) and, “at a later date,” figure out what to do with the rest. Sounds a lot like amnesty and a lot like an insecure border. 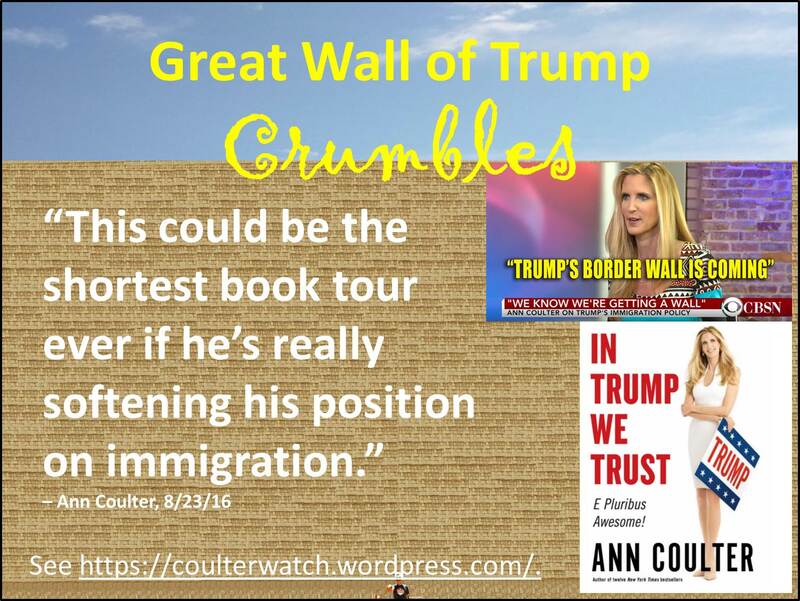 Ann Coulter famously championed Trump for his alleged Great Wall of Trump and his alleged “mass deportation” of millions of illegal aliens. That’s exactly what Trump started to do. On the very day her hagiography of Trump was published, the Trump campaign began its reversal of his immigration policy positions. As reported in New York Magazine, Coulter quickly expressed the first two stages of grief: denial and anger. In fact, she experienced all five stages in little more than one day. So much for mass deportation. Trump’s magnificent wall was a fraud from the beginning. Indeed, he stole some of his ideas from his biggest rival, Sen. Ted Cruz. Just as his entire presidential campaign can be reasonably interpreted as a sham to give the presidency to Hillary, so, too, his hostile opposition to amnesty appears to have been counterproductive, perhaps purposely so. Red State’s Neil Stevens spotted a disturbing trend. Looking at Fox News polls from July 2010 to the present, Stevens discovered a dramatic shift in support for amnesty. Ann Coulter obviously never really knew the real Ronald Reagan. Once a self-described Reagan conservative, Coulter now claims that Donald Trump is the new (and improved) Ronald Reagan. In her best-failing book, In Trump We Trust, Coulter offers a caricature of the Gipper even as she lambastes conservatives for preserving his legacy. Chapter 6, “You’re Not Reagan,” is replete with banalities, blunders, and bluster. Speaking largely to those who never knew Reagan (and the politically disinterested, disaffected, and disillusioned), Coulter offers humor and false analogies in place of facts and reasons. Indeed, this chapter, in particular, employs rationalization instead of rational arguments. Among the many ludicrous claims Coulter makes about Reagan, these two are especially laughable. To buttress her claim, Coulter proffered one quote from the Reagan-Carter debate in 1980. Reagan could even hold his own with an intellectual giant like William F. Buckley, Jr.
Reagan, famously, knew the details and, more importantly, what those details meant and the underlying principles involved. As to her second point, are we to consign to the ash-heap of history George Washington and Abraham Lincoln because many Americans are woefully unfamiliar with those giants? Now, Coulter reviles “Republicans [who] believe they can capture Reagan’s greatness by repeating his answers to the problems of three decades ago.” But Coulter fails to realize that Reagan governed by paying attention to eternal principles. Actually, no. Washington, Lincoln, and Reagan were great American leaders, men of character, integrity, vision, and courage. The GOP is (or, at least, used to be) “the party of Lincoln and Reagan.” Trump has effectively jettisoned that legacy down a memory hole in his quest for power. 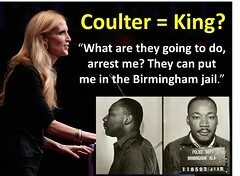 But Coulter’s observations miss the salient point. Donald Trump is no Ronald Reagan. Trump cannot be trusted to keep any of his promises. Trump lacks the requisite character and discipline to do so. Indeed, Trump’s only moral compass is his own self-interest. In the 1990s, Coulter regarded Reagan as the greatest American president of the 20th century. Now, not so much. 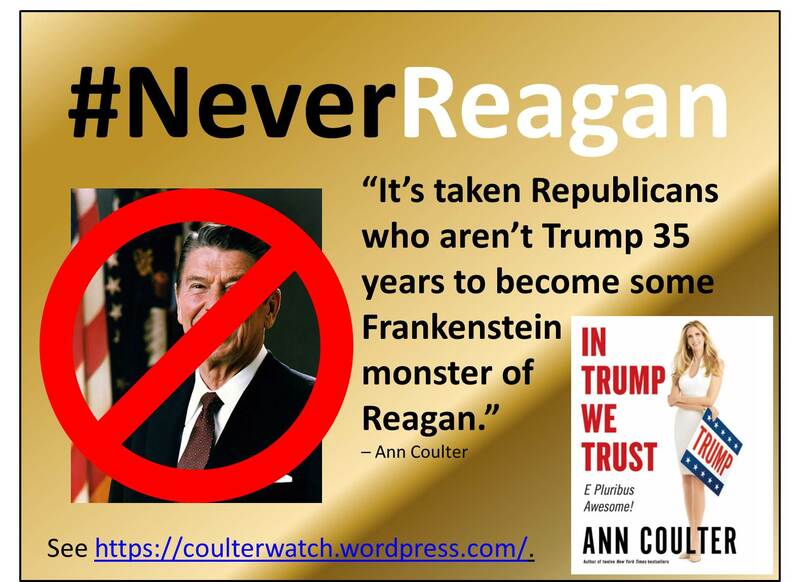 Indeed, it turns out that Coulter never really knew Reagan. Reagan’s legacy is as much who he was as what he did. He accomplished what he did because of who is was and what he became. Twelve years ago, the nation mourned his passing while celebrating Reagan’s life and legacy. Hundreds of thousands of people visited the Capitol Rotunda for his lying in state. Reagan biographer Craig Shirley has declared that the Republican Party is dead but that Reaganism is alive and well and living in a populist-energized Conservative Movement. 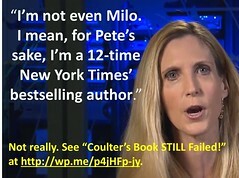 See “Coulter’s Big Fail” at http://wp.me/p4jHFp-ia. See “Alternative Ann Coulter Book Covers” at http://wp.me/p4jHFp-gr. Ann Coulter, Good Morning Britain, ITN, 9/27/16. See “My Pilgrimage to Reagan” (5 pp.) for a first-hand account of that experience. See also a 1997 “Ronald Reagan Special Edition” (28 pp) with tributes from people who knew him best.